The research project Mechanisms of cross-cultural interaction: Networks in the Roman Near East (2013-2017) investigates the resilient everyday ties, such as trade, religion and power, connecting people within and across fluctuating imperial borders in the Near East in the Roman Period. The project is funded under the Research Council of Norway's SAMKUL initiative, and hosted by the Department of archaeology, history, cultural studies and religion, University of Bergen, Norway. This week I went to the annual meeting of the UK Classical Association, which was hosted by the University of Nottingham this year. Colleagues Leonardo Gregoratti (Durham) and Eran Almagor (Ben Gurion University of the Negev) organized a session on "the Eastern Client States", where I took part. Client states in this context refer to polities in the Near East, that held a large degree of autonomy and were rued by local princes, but which were part of the Roman Empire or the Parthian Empire. 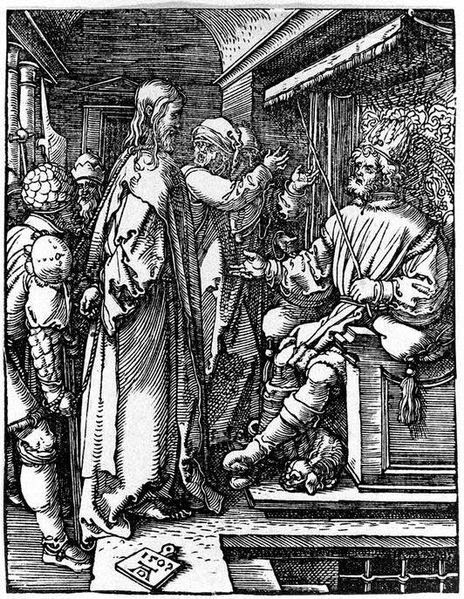 Herod the Great, king of Judea 37-4 BCE and universally infamous due to the infanticide ascribed to him in the Gospel of Matthew, is perhaps the most famous of these rulers. In fact there were many of them, and even if there is a clear tendency towards direct and centralized rule over time, the Roman Empire always remained a patchwork of cities, tribes, and principalities with varying degree of autonomy, although there was never any doubt that the real power was in Rome and later in Constantinople. The client rulers are one of the cases I am studying, with the aim of better understanding the fabric of Near Eastern society in the Roman period. In time I plan to make a study of them for the whole period of Roman rule in the Near East, but for the presentation in Nottingham I started in an end, and attempted a network analysis of the system in the first century BCE and the first century CE. Below is a short summary of my preliminary ideas and finds. Comments and advice on how I could develop this are greatly appreciated. I started by plotting 163 members of ruling dynasties in the Near East from 63 BCE (the start of Roman Rule) until 125 CE and the 369 ties of full siblinghood, marriage and descent between them in Excel. The entries were based on Richard Sullivan's invaluable prosopographical articles for the Aufstieg und Niedergang der Römischen Welt, bolstered with information from classical encyclopedias. The resulting spreadsheet was saved in csv-format and easily imported into the open-source graph visualization software Gephi using this great tutorial from University of Wisconsin Green Bay Digital Humanities blog. After some time spent identifying and correcting errors in my database that became evident during the import-process, i got this unprocessed graph (below). It does not immediately make much sense. The thick lines represent connections between individuals sharing more than one tie, in effect people marrying their siblings, an unusual, but not unheard-of practice among royals at the time. Here, the network is organized according to dynasty, showing the different connections of marriage, descent and siblinghood for the period from 75 BCE until 150 AD and colored after which dynasty people were born into. On one hand of course this is problematic, because dead and living people are included in the same network, on the other hand it is useful, as dynastic connections were used for claims to legitimacy as well as territory and position, and it helps us see which families were important local players and who were more marginal. In that sense it gives us a more comprehensive picture than the stemma we usually look at when we study dynastic networks. Then I wanted to see how the network changed over time. The problem with this is that we don't have secure information about when all the people in question actually lived. I've tried to overcome this by assigning them quarter centuries when they were politically active, either as rulers or simply as marriage partners and parents. Some were active in dynastic politics for almost 75 years, others only briefly. 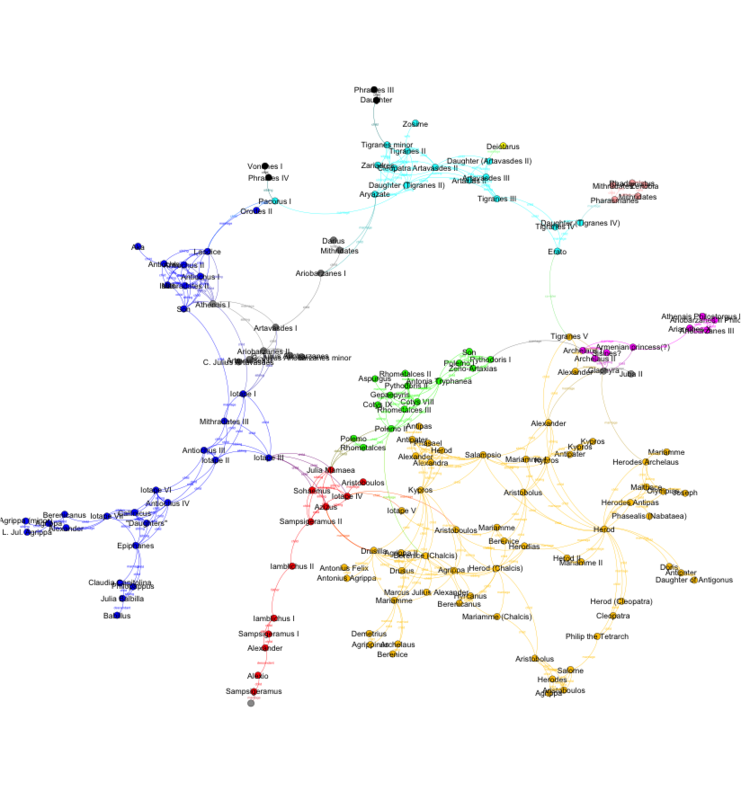 By assigning each period a unique value in Gephi and using the software's partition feature I was able to create time-series of the network. I've made a short movie of these (below). Here individuals have been sorted into overlapping 25-years intervals, according to the periods in which they were active. Some of them were political figures for three quarters of a century, others only briefly The slides show how the different dynasties engaged with each other over time, making it possible to discuss questions of integration, fragmentation and marginalisation. It shows very well, for instance how the Herodian dynasty of Judea emerges as the regional power-broker in the late first century BC, and how Armenia is constant arena of dynastic competition, where different dynasties vie for influence. Dynasties such as Emesa never really becom important, while Commagene and Cappadocia remained in the game, but were marginalized over time. In this example we no longer see the individuals, but ties between the different dynastic centres instead. 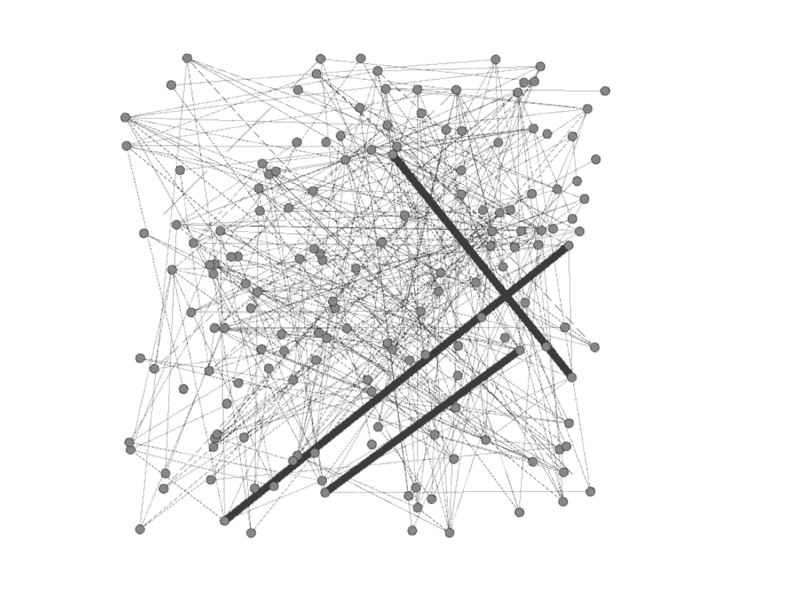 They move slightly because the scale of the network varies over time. In terms of geography, we have three main clusters, centered on Anatolia, Northern Mesopotamia and Judea, with Armenia and Commagene as not only the geographical, but also the main dynastical links between them. Also this allows us to look at interaction across the so-called border between the Parthian and Roman worlds or spheres of influence. Doing this, we see that these networks are geographically very expansive, spanning from Mauretania and Rome in the West, to Ctesiphon in Mesopotamia in the east at their greatest. We also see that the great rivals of the Romans, the Arsacid dynasty, by way of Parthia and Media Atropatene, are active participants in the dynastic networks of the Roman Near East, although they seem to become less important over time. I had great fun while trying to model the client king system, but I also found it scholarly very rewarding. More on this at a later stage, but network perspectives allow us to move the focus from the imperial center to a multiplicity of peripheral points of view. Each of the 163 individuals in the network were at the centre of their own world, and approaching them as a social network allows us to appreciate this in a different manner. At this stage this is very much work in progress, and I'll continue to develop the technical as well as the scholarly side of this in months to come. Thanks to the audience and my co-panelists in Nottingham for a good discussion!